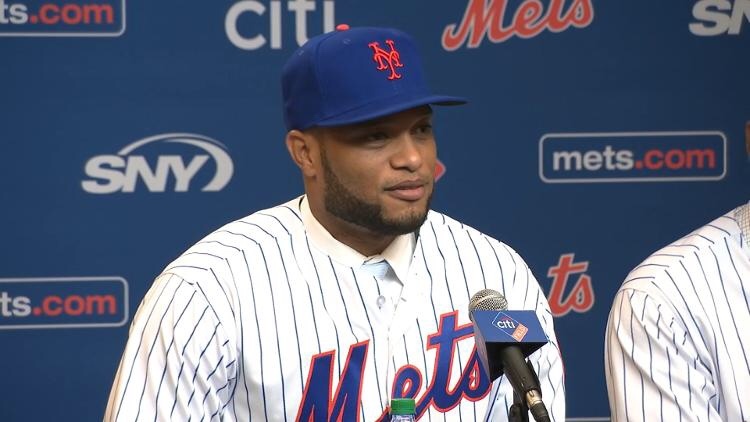 Cano arrived at Mets camp earlier this morning and had a press conference at around 9:45 A.M. When asked about if his approach to Spring Training has changed since he’s come along through the years he quickly said “I feel like I’m 25” and continued speak about how he doesn’t take the Spring for granted and that he likes the grind. He continued to say he spends his off-season working on every aspect of his game and doesn’t single out a particular goal or plan. He also thanked the Mariners for signing him to a ten year contract and enjoyed his five seasons out in Seattle. However, he’s expecting change now that he’s back in New York and after not making it to the post season in his tenure with the Mariners. “I grew up in the Yankees system, they teach you how to be a champion in the Minor League… I wasn’t able to make it in Seattle and I know it’s not because we didn’t have the team, it was just part of the game” Cano said. He then added “Coming back here, I’m looking forward to going back to the playoffs”. Cano was asked if he was receptive towards playing any first base this season and said no one from the organization has come up to him and speak to him about spending some time on corner. When asked about how he feels about Brodie Van Wagenen and his attempt to putting together a team, Cano said “He wants to win” and thinks he’ll end up being a good General Manager after being an agent. He joked around after being asked if he had given Edwin Diaz any advice for playing in the Big Apple saying “I tell Edwin you guys are tough” but then got serious and said “as a young kid, I just him it’s the same thing… it’s different than coming from the system in Seattle. Cano went out by saying just the right thing, “No one will replace David Wright… I feel special that I have his locker” when asked about now being the lightning rod for the media and offense.